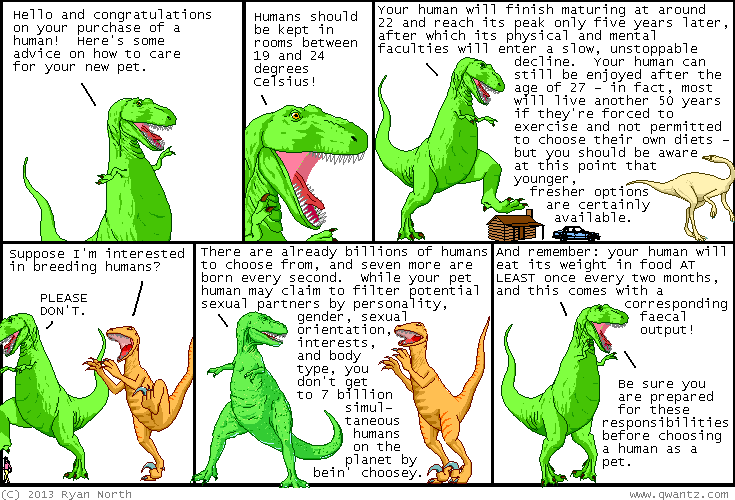 Dinosaur Comics - January 29th, 2013 - awesome fun times! –"It's A Wonderful Life" originally featured FIVE separate quicksand scenes! January 29th, 2013: Remember how last Thursday T-Rex invented a food? Yesterday Aviatrix made that food. She included a writeup of the complete cooking process and notes "The dish was astonishingly edible, considering it was invented by a fictional dinosaur and deliberately concocted to be as ludicrous as possible. It's pretty sweet, and this is coming from someone who ate Nutella out of the jar with a spoon for lunch. I would recommend decreasing the ice cream-to-beef ratio to perhaps 1:2, add more chili powder and other spices at an earlier stage of cooking and, as I mentioned earlier, play with the ice cream flavour. My photographer had three helpings. He said it was better on toast, and suggested the wine pairing shown below. That is: something cheap, homemade, and plentiful." I recommend you read the whole post as there are photos that can aid you in your own cooking adventures. I am glad AND surprised that alive humans like this food. One year ago today: ghosts that eat food are dicks because they consume resources without needing to and without generating anything from them. it is pure waste. even if a ghost recycles the container the food came in, they're still not good ghosts. geez. come on.